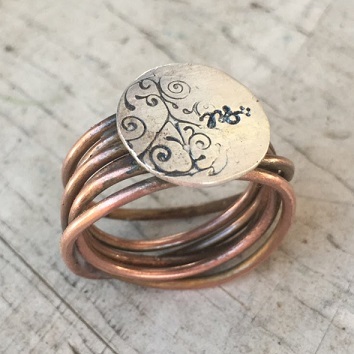 Wrap and tangle multiple strands of gorgeous copper wire into a pleasing band, stamp a sterling disc with JOE’S Garage’s own Grow Peace stamp, then solder your disc securely to your ring band. Designed for ComEd's 2018 Wicked bus trip! Materials included. Ages 18 and up or 14-17 with adult. Saturday Bitty Boîte Trinket Binge! Torchwork - Chain Making: Inside the Box! Torchwork - PMC Empath Charms! Torchwork - Initial Disc Charm! Torchwork - Winding Waves Ring!